Freshman center Kayla Mokwuah looks for a shot during a women's basketball game against Towson Tuesday. 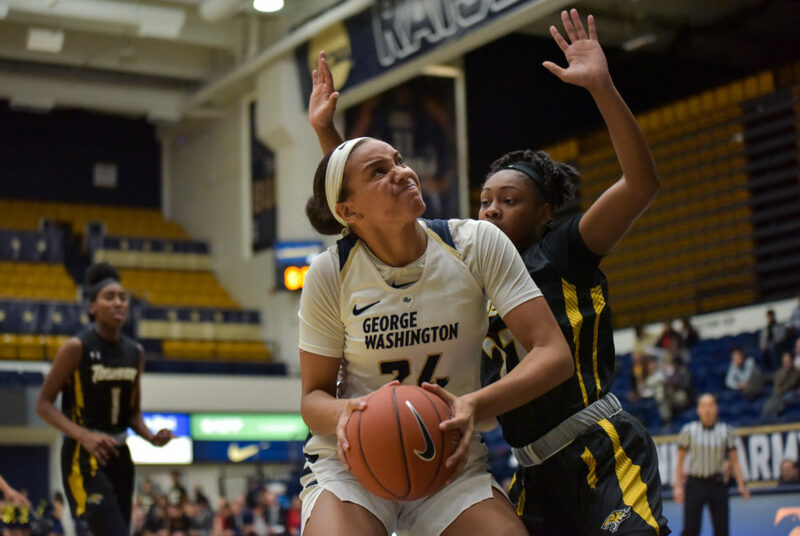 Women’s basketball has shown flashes of the kind of play that earned GW the Atlantic 10 Championship last season, but has lacked consistency for the effort to show in its record. With a win against Towson Tuesday, the Colonials (2–5) broke their four-game losing streak and exhibited an offensive effort that has begun looking up in the past few games. Their 76-point total was their highest score this season and five Colonials ended the night with double-digit points. The Colonials started the season shaky from beyond the arc, averaging just 43.5 points per game in GW’s first four matches. But in the last three games, the team has steadily improved its offense through increasing shooting efficiency and three-point scoring, despite recording two losses in the span. Despite losing to two elite teams – Georgia Tech and No. 13 NC State – over Thanksgiving break at the Cancun Challenge, each defeat showed a glimmer of hope in individual aspects of the team’s play. The Colonials’ offense recorded 55 points and 61 points against elite teams Georgia Tech and NC State, respectively, last week. The games marked the first time all season GW garnered final scores of more than 40 points in back-to-back games. Three Colonials tallied double-digit points and the team ended the night shooting 39.3 percent from the field – its most efficient night in three games – in their 69–61 loss to No. 13 NC State. The Colonials forced 15 turnovers while committing a season-low five and found themselves one basket away from taking the lead at multiple points throughout the game. GW outscored Georgia Tech in two of four quarters, including an 18-point rally in the final frame, despite dropping the match 70–55. GW brought its improving offense back to the Smith Center Tuesday and the Colonials shot at a 41.2 percent clip on 21-for-51 shooting against Towson and picked up 29 points from the charity stripe. The Colonials also swatted a season-high five blocks against the Tigers, four of them coming from freshman center Kayla Mokwuah. “If we’re going to get good by the end of the year, we need those guys to continue to progress so they can help the more experienced players coming back from last year,” Rizzotti said after the game against Towson. The Colonials’ shooting from beyond the arc has been a catalyst for other aspects of the team’s offense. The team recorded 10 triples against Georgia Tech and 11 against NC State, doubling the Colonials’ previous season-high count of five-made three-points shots in a game. The Colonials have also been able to prevent threes, limiting their opponents to 22.2 percent from the three-point line while averaging 30.1 percent shooting. GW held Towson to a 17.4 shooting percentage from deep Tuesday. Senior guard Mei-Lyn Bautista has been instrumental in GW’s three-point windfall. She scored five triples in both games played in Cancun, providing a significant portion of GW’s overall scoring production while tying her own three-point record in a game twice-over. She leads the GW squad with 82 points on the season. Senior forward Kelsi Mahoney has also been strong from beyond the arc this season, posting 14 triples, including four against NC State. Sophomore forward Neila Luma has made significant contributions for the Colonials after a slow start of her own. Luma scored a total of 23 points in Cancun, the 14 points against NC State coming just two points shy of reaching her career record. Against Towson, she broke her career record, recording 18 points while grabbing eight rebounds. Point production by Bautista, Mahoney and Luma has helped drive GW’s offense, but Rizzotti said finding a more balanced effort is paramount to lasting success. Freshmen guard Maddie Loder and Mokwuah had breakout games against Towson, recording career-high totals of 15 points and 12 points, respectively, rounding out GW’s balanced scoring effort against the Tigers. Mokwuah tallied a career-high four blocks out of GW’s five on the night. Despite these areas of strength, GW has been hampered by a lack of production under the glass and is still struggling on the defensive end. The Colonials have been out-rebounded by an average of 8.6 rebounds per game and GW is giving up significantly more second chances than the team is getting, sitting second to last in the A-10 in offensive rebounds. In order to improve, the Colonials need to sweep under the glass on both sides of the court. GW hosts Monmouth at the Smith Center Sunday at 2 p.m.